1 Some time after this, Jesus crossed to the far shore of the Sea of Galilee (that is, the Sea of Tiberias), 2 and a great crowd of people followed him because they saw the signs he had performed by healing the sick. 3 Then Jesus went up on a mountainside and sat down with his disciples. 4 The Jewish Passover Festival was near. 5 When Jesus looked up and saw a great crowd coming toward him, he said to Philip, “Where shall we buy bread for these people to eat?” 6 He asked this only to test him, for he already had in mind what he was going to do. 7 Philip answered him, “It would take more than half a year’s wages to buy enough bread for each one to have a bite!” 8 Another of his disciples, Andrew, Simon Peter’s brother, spoke up, 9 “Here is a boy with five small barley loaves and two small fish, but how far will they go among so many?” 10 Jesus said, “Have the people sit down.” There was plenty of grass in that place, and they sat down (about five thousand men were there). 11 Jesus then took the loaves, gave thanks, and distributed to those who were seated as much as they wanted. He did the same with the fish. 12 When they had all had enough to eat, he said to his disciples, “Gather the pieces that are left over. Let nothing be wasted.” 13 So they gathered them and filled twelve baskets with the pieces of the five barley loaves left over by those who had eaten. 14 After the people saw the sign Jesus performed, they began to say, “Surely this is the Prophet who is to come into the world.” 15 Jesus, knowing that they intended to come and make him king by force, withdrew again to a mountain by himself. 16 When evening came, his disciples went down to the lake, 17 where they got into a boat and set off across the lake for Capernaum. By now it was dark, and Jesus had not yet joined them. 18 A strong wind was blowing and the waters grew rough. 19 When they had rowed about three or four miles, they saw Jesus approaching the boat, walking on the water; and they were frightened. 20 But he said to them, “It is I; don’t be afraid.” 21 Then they were willing to take him into the boat, and immediately the boat reached the shore where they were heading. Jesus often went away from the crowds to be alone. He needed time to pray to His Father. Other times, He went away from the crowds with His disciples to teach them important things. On this occasion, it seemed that He wanted to get away from the Jewish leaders. They had accused Him and He had answered them back strongly. However, this was not yet the time for Him to die. Jesus and His disciples went back across Lake Galilee but the crowd saw where He was going and the people followed him on the land. The people went round the north shore of the lake to be at the site where Jesus and His disciples would come ashore.. It was nearly the Passover. Many Jews were travelling to Jerusalem and many of them had joined the crowd to follow Jesus. By the time they found Him on the mountain, the original crowd had increased in size. John recorded that there were 5,000 men there. The actual crowd was probably much larger because John did not include the women and children in this count. The crowd had been travelling for a long time, around the lake so Jesus knew that they were tired and hungry. It would take a miracle in order to feed so many people. Jesus already knew this but he wanted to see if Philip knew it also. So Jesus asked Phillip a question on purpose (verse 5). Philip had lived in Bethsaida, which was the nearest town and would know where to buy food. Immediately, Philip tried to think of a practical solution to the problem. He estimated the cost. But he realized that the disciples did not have enough money to buy food for everyone! One silver coin was the amount that a workman could earn in a day. So 200 coins was about 8 month’s wages for one man. This was a lot of money. Jesus intended to make Philip’s faith stronger by having him think of a practical solution to an impossible problem. Phillip, however, had not included God in his solution. Jesus’ disciples did not have the resources to feed so many people. But the lack of resources does not stop what God can do! A young boy gave what he had: his own lunch. But Andrew, like Philip, still could not understand what was possible for God to do. Probably the disciples had money with them, to buy food as they traveled. But because their money was not enough, they did not even think to offer it. Yet, this boy had much less than they had. In fact, the boy was probably poor. Our clue: Only poor people cooked with barley, which was usually food for animals but still the boy offered what he had to Jesus. Jesus took it and a miracle happened. Jesus thanked God for the small gift and then passed it to the crowd. Everyone there had enough to eat. We learn from this boy is that God can take our meager resources, our time, our money and our possessions and our God-given skills While we may not think that we have much to offer to God even the smallest offer (gift) when given from the heart, is better than nothing. God will take whatever we offer to him and do great things with it on behalf of His kingdom. After the meal, there was a lot of food that the people had left. We can learn from this, too. We can offer ourselves and our resources to God. and then God does much more than we can imagine. The people used the term “Prophet” as a reference to the person about whom Moses prophesied (Deuteronomy 18:15). Moses had said that this person would be “a prophet like me (Moses). ” Moses was talking about the Messiah. Moses had led the Israelites out of a land where they were slaves. The Jews were not slaves at the time of Jesus. But they did not rule in their own land. The Romans ruled their land forcing the Jews to obey the laws of the Roman government. For the average Israelite, they wanted to be free from Roman rule and were looking for a leader who would defeat the Romans on their behalf. Jesus had the power to do something that did not seem possible and the crowd saw this. Their reaction was to make Him their king. They wanted a political and military ruler who would lead them to fight against the Romans. Unfortunately, the Jews had the wrong idea about what the Messiah was there to do. The Jewish nation did not want God’s plans, they wanted to use Jesus for their purposes. So Jesus escaped from them and later, in the synagogue at Capernaum, he would try to explain more about who He was and why He had come to the earth (John 6:22-59). When the disciples were about half of the way across, they saw Jesus. The most direct route to Capernaum is about 6 miles. Jesus was walking on the water towards them. Immediately this brought fear as they thought Jesus was a spirit. (See Matthew 14:26; Mark 6:49.) 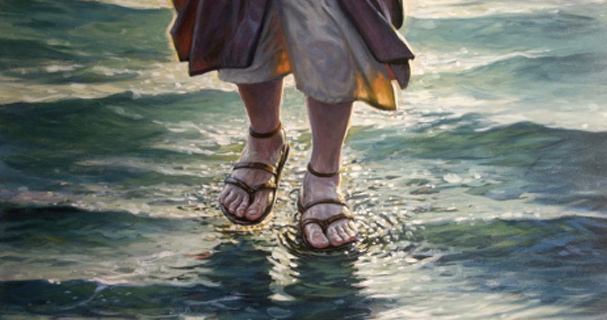 While the disciples had seen Jesus do miracles, they did not expect Him to walk on the water. However, as soon as Jesus spoke, the fear left them. They wanted him to get in the boat and another wonderful thing had happened. Suddenly, they had reached the place where they were heading. Their struggle was over. They were safe and Jesus was with them. This story shows us how Jesus helps us, too. Bad things can happen to us suddenly, like the storm on the lake. We may feel that we have no control over our situation. We may think that we are struggling alone with our problems. But sometimes Jesus comes to us when we do not expect him. He may surprise us by the way that he comes to us. But Jesus can do anything! He protects us from bad things. We know that we are safe with him and just as suddenly, we are on a calm shore. Why do crowds follow people today? What do you define as a miracle? The people were following Jesus because they wanted something – How is that still prevalent in our society today? When you think about an unexplained events such as the feeding of the 5,000 or walking on water, how many different miracles do you see? Which do you think is the greatest miracle and why? What do these two stories teach us first, about our GOD? and second, about JESUS? In spite of being witness to these two stories, the disciples still struggled with their faith – What human traits, weaknesses, or attributes make us vulnerable to this struggle?